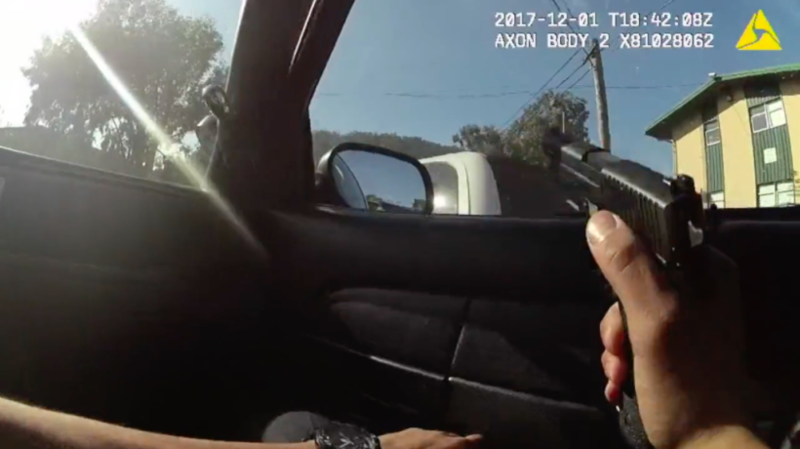 Photo: Body cam footage of Officer Chris Samayoa readying his gun before firing through his window and fatally shooting Keita O’Neil, an unarmed carjacking suspect, without warning. With three days left in the current legislative session, AB 931 must pass before Friday to have a chance at landing on Gov. Jerry Brown’s desk, and radio spots and social media campaigns are pushing voters to cajole their local assembly rep.
AB 931 would change the law so that cops can use deadly force only when absolutely “necessary,” meaning only when an officer has exhausted all “reasonable alternatives,” such as de-escalation and less-lethal options, such as pepper spray. Such a law could have come into play regarding several recent San Francisco police shootings including one in Bayview where a rookie cop shot and killed an unarmed suspect — without warning — as he ran by the officer’s car. Supporters say the legislation would reduce lethal police use-of-force incidents and make it easier to charge officers who have used excessive force and failed to follow departmental procedures. “Over the last couple years, the response of communities to unjustifiable police use of force has created a lot of attention and a call for change,” said Abdi Soltani, executive director of the American Civil Liberties Union of Northern California. In fact, the legislation is so important to the group that it has paid for radio ads urging California residents call their representatives and urge them to show support for the bill. Opponents, largely statewide law enforcement unions, say the new standard would endanger officers by causing them to second-guess their decisions in potentially dangerous situations. Other law enforcement groups — such as the California Peace Officers Research Association (PORAC) and the California Police Chiefs Association — also vehemently oppose the legislation. Both groups have also put out radio ads asserting that the law would create a public safety issue by “handcuffing” police officers and preventing them from apprehending criminals. Numerous law-enforcement groups have run ads on Twitter — even attempting to cast doubt on the ACLU’s oft-cited claim that, of the 172 deadly police encounters in California last year, half the victims were unarmed. Neither PORAC nor the ACLU would disclose how much they have spent on the ads. The legislation comes in an era of increased scrutiny of how police officers use force, as controversial police shootings of unarmed men of color continue to proliferate nationwide. In March, Sacramento police fatally shot Stephon Clark, an unarmed African American. Sacramento-based lawmakers couldn’t help but take note. The Mission District has seen five police shootings since 2011 — including the 2016 shooting of Luis Gongora Pat, a homeless Mexican immigrant who police shot dead on 15th and Shotwell 30 seconds after leaving their vehicles. Police said Gongora was waving a knife and they feared for their lives when they shot him. San Francisco District Attorney George Gascón, who supports AB 931, declined to file charges against the officers involved in Gongora’s shooting, or any other, arguing that the current legal standard — that officers can use lethal force when even perceiving a threat — prevented him from building a strong case. “The available evidence would not allow prosecutors to prove beyond a reasonable doubt that their use of force under such circumstances was unreasonable,” Gascon’s final report states.